Losing access to wireless Internet, SMS, e-mails, and social apps unexpected, and what do you get? Well, that was what happened tonight when we went a theater that was two stories underground. It was a very nice theater. I loved it and appreciate the friend who took me. 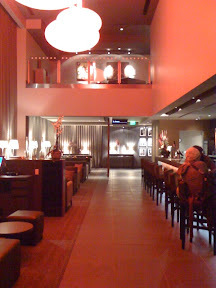 Yeah, that was the new Gold Class Cinema in Pasadena, CA. That was the only picture I took worth posting. But down there, no signals at all. Doesn't matter if it's VW, ATT, Sprint, or T-Mobile. There was a lot of comments about it. A few rushed up the escalator to get in one last text or call before the movie started. But it was definitely worth being out of touch for a bit given the first class service you receive there. You're at the movies anyway, right? Here's the interesting thing. 24-40 Seats per theater. You have your own reclining chair that puts Picard's command chair to shame. Even if you could use your mobile device, you were not going to be able to bother anyone because you seated so far apart from someone else. Drinks and food included in the ticket price. But see, it was the expectation of being able to use your iPhones and Blackberries (again it's iPhone and Blackberry because I didn't see any other type of phone there) and not being able to that made everyone say a word or two about it. I simply started playing my games until the movie started. Imagine other situations where mobile users addicted to their wireless access suddenly isn't able to for a long period of time. I think our brains have been accustomed to looking forward to getting that wireless fix. It's almost like a drug.